You may be young only once but you can relive the fun with Jim Daly. "A few more minutes and the bell will ring, bringing an end to the fun. The school yard will be empty, and the sounds will disappear into memory. Have you ever stood in an empty school yard and noticed the silence? Without children playing, there's a lonely and sad feeling. A school yard, to me, is alive. It has spirit, soul, and heart, waiting silently and patiently for the next recess when the familiar sounds of joyful children fill the air with energy and happiness." 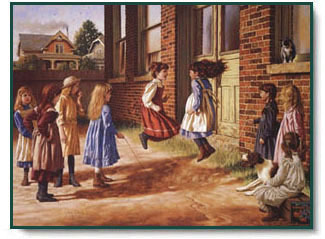 Just Before the Bell copyright© 1996 by Jim Daly.